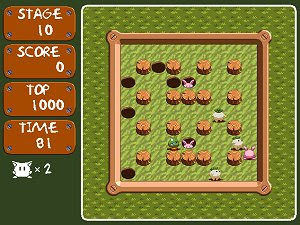 Poton is a small freeware game with Japanese origins and inspired by the Bomberman saga. The presentation is very similar and so is the objective – to eliminate all the enemies in the screen –, although the graphics are different. But the most important thing is that the gameplay can also be addictive just like in Bomberman. Instead of using bombs, the player has to create holes for the creatures to fall down, shutting them immediately after so the enemy doesn’t escape.